John Rawls--is one of the most powerful approaches to social justice in the Western tradition. But as Nussbaum demonstrates, even Rawls's theory, suggesting a contract for mutual advantage among approximate equals, cannot address questions of social justice posed by unequal parties. How, for instance, can we extend the equal rights of citizenship--education, health care, political rights and liberties--to those with physical and mental disabilities? How can we extend justice and dignified life conditions to all citizens of the world? 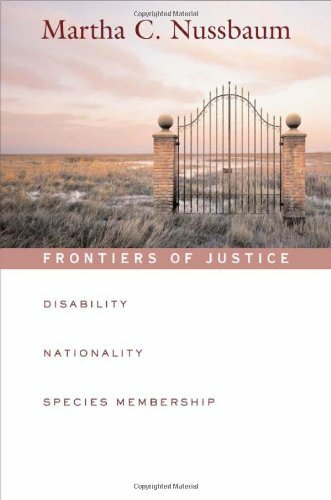 And how, finally, can we bring our treatment of nonhuman animals into our notions of social justice? Exploring the limitations of the social contract in these three areas, Nussbaum devises an alternative theory based on the idea of "capabilities." She helps us to think more clearly about the purposes of political cooperation and the nature of political principles--and to look to a future of greater justice for all. Globalizing the Capabilities Approach: What Institutions? "Beings Entitled to Dignified Existence"